According to a recent study in the American Journal of Preventive Medicine, eating fish once a week could increase brain health and prevent cognitive diseases such as Alzheimer’s. 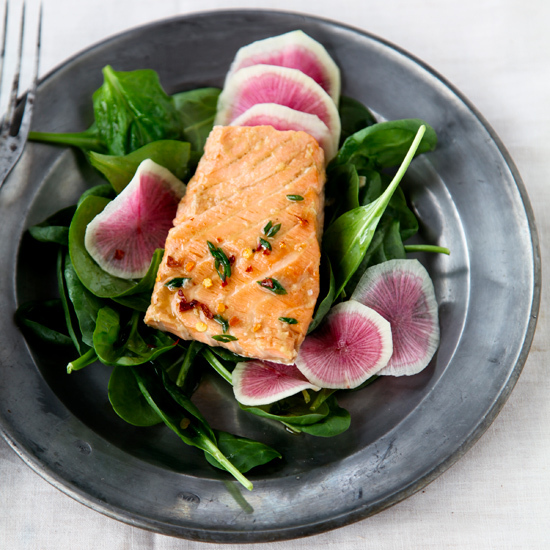 Here, 10 fantastic fish recipes to help you reap the benefits. F&W’s Test Kitchen whiz Justin Chapple’s brilliant and easy way to fillet a fish is just one of the great reasons to enjoy fish now. According to a recent study in the American Journal of Preventive Medicine, eating fish once a week could increase brain health and prevent cognitive diseases such as Alzheimer’s. Here, 10 fantastic fish recipes to help you reap the benefits. Umami-rich dried shiitake mushrooms give this healthy fish a terrific savory flavor. This Asian-inspired dish is fantastic with stir-fried asparagus. Baking the fish and vegetables in aluminum foil creates a flavorful broth. Fennel-seed marinade, fennel bulbs and chopped fennel fronds star in this quick dish. Any rich, full-flavored fish like mackerel, shad or kingfish would also be great with this bright citrus dressing. Pair these delicious sea bass fillets with an herbal Sauvignon Blanc or a crisp, aromatic pilsner. Chives do double duty in this simple salmon dish: They’re in the marinade and also sprinkled atop the finished fish as a final flash of flavor. Fresh fish collars are briny, rich and super simple to prepare. F&W chef-in-residence Eric Ripert serves this delicate fish with a rich turnip puree. Succulent shad fillets are ideal for broiling.